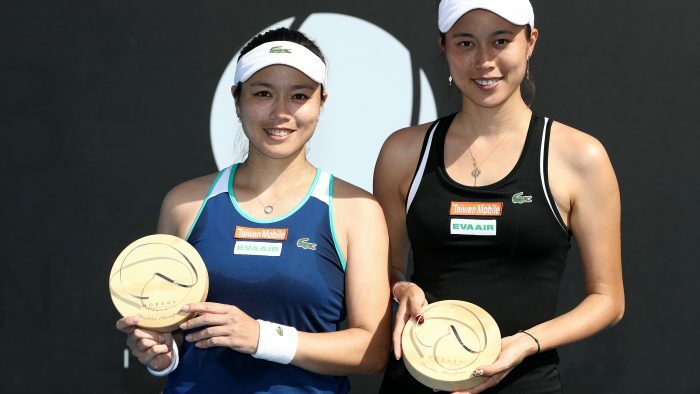 In the 76-minute final, the Chans defeated Kirsten Flipkens of Belgium and Johanna Larsson of Sweden 6-3, 3-6 and 10-6 in a 10-point tiebreaker. The victory earned them US$12,300 in prize money and marks the 11th Women’s Tennis Association title they have won as a team. Chan Yung-jan wrote on her Facebook page that overcoming the challenges posed by the heat and the wind gave her a huge confidence boost. The sister’s last doubles triumph was at the Hong Kong Tennis Open in 2017. Ahead of the Hobart game, they also finished runners-up at the Brisbane International Jan. 5 in Australia.